Rhymer’s, on Cane Garden Bay in the BVIs is typical of many small, multifunction establishments one finds in island cruising. It combines a hotel, beach bar, gift store, grocery store, beauty salon, and laundromat. You find what you can and adjust to what is available. Having said the above, I believe most people out there cruising spend far less each month than they would at home. In fact, I read somewhere that one couple figured they spend roughly a third of what they spend at home in monthly living expenses. Food is usually the biggest expense, and overall monthly expenses can be cut back by not staying in marinas and keeping a sharp eye on discretionary spending. You can spend as much as you would if you stayed at a fancy resort, or you can get by with much less. It is up to you. If you need a new pair of boat shoes, the old ones get tossed. For many, this cruising thing can be a simple, but satisfying life. Of course, you can add in the cost of flights home for family or personal business, or rental cars to make side trips to explore a new country, or any number of other discretionary spending to take local tours, and let’s not forget the purchase of a drone. Entertainment costs usually go up when your family and friends come to visit. Some countries charge check-in or transit fees. Another potential expense goes back to a subject I wrote about some time ago. The most successful cruisers I have ever met have one thing in common. They get off the boat from time to time to do something else. It keeps them from burning out being on the boat 24/7, year after year. No matter what that might include, such as a winter skiing in the mountains, or touring a country by land travel, or recharging one’s batteries visiting family and friends, it keeps the dream alive and fresh. If you want to live the cruising life beyond a couple of years, this is important advice. In terms of specific $$$ numbers, spend time on the Internet and YouTube to find the cruising couples and families who write blogs and vlogs. Almost all of them at one time or another discuss the costs of their cruising style. Pretty typically, these people report they spend in the range from $1500-$2000 to maybe $4000 a month. True minimalists can get by on far less, of course, but most of today’s cruising crowd are not interested in eating rice and canned vegetables every day. Some grocery stores, such as this one in Soper’s Hole, BVI, are well stocked because of the many charter boats cruising the area. The best part of cruising is the people you meet, both other cruisers and the local population. And the local people who live with less always seem the happiest. It’s so fun to look at all of these pictures from the past. 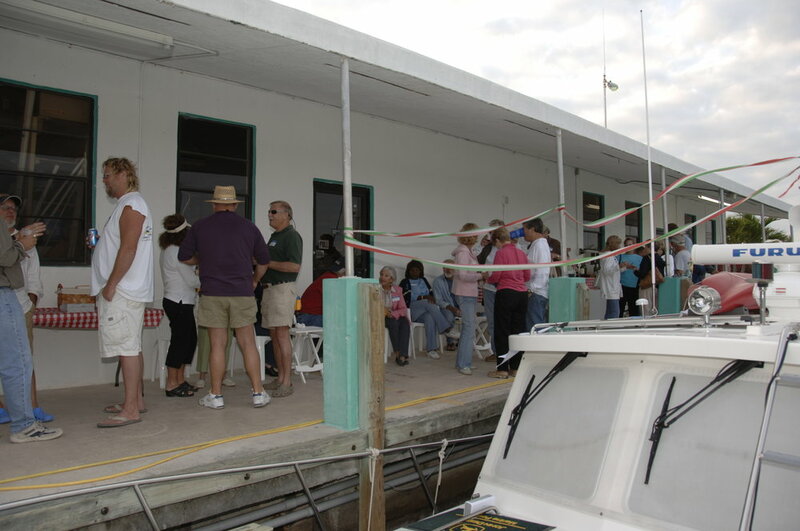 One year Laurene and I hosted a PassageMaker pizza party at our marina in Marathon for all of the many friends who made the Florida Keys their winter home. It was great fun and highlighted why meeting and sharing with other cruisers is such a wonderful part of cruising. Which brings up a comment on the cruising lifestyle, something which people have pointed out many times over the years. It has come up in seminars and panel discussions at both TrawlerPort and Trawler Fest. In fact, the couple who wrote about cruising in our very first issue of PMM made a point of discussing this. I am not here to preach, just highlight it so there is an awareness. You can easily blow your cruising budget if you fall into the common trap of new cruisers whose mindset was formed when their boating was restricted to weekends. It is apparently very easy for new cruisers, in the excitement of finally shoving off, to treat every day on the water as if it is still the weekend because that is their association with boating. And every night is Saturday night. Woo-hoo! When I lived aboard years ago on Seattle’s Lake Washington, I would see dozens of empty wine and liquor bottles in the marina dumpster after every weekend. Those of us who lived on our boats used to joke about it, the party mentality of weekend boating. Eating out, having beach and boat get-togethers with appetizers and drinks almost every night is not real life. Stretching Saturday night into a seven-day party will make a huge dent in your cruising funds. Not to mention it is not particularly a healthy view of the cruising life. Let’s face it, the social aspect of cruising is one of its strongest attractions. But regularly inviting others to your boat for drinks and munchies can quickly add up, as well as use up your provisions. Ask your guests to bring their own drinks and a dish or plate of snacks to share. Seasoned cruisers already know this is part of the social etiquette of cruising. Sundown time aboard this Krogen 42. Everyone brings something to share and their own drink of choice. This is a great way to spend time together and look for the Green Flash. When you move aboard, either full time or for extended cruising, do you still own one or two cars? Do you need a storage space for your bicycles, that soft-tail Harley and other toys, as well as land-home furniture and possessions? The ongoing money drain of land storage can blindside cruising funds unless budgeted, and some ultimately find they are better off without these strings to a land life, and getting rid of unnecessary debt. They find it best to cut the ties and be done with it. As anyone who ever rented a storage space knows, the monthly storage rates have an insidious tendency to creep up every so many months. The once affordable storage space, packed with stuff you may not remember you own, becomes expensive. And when you finish your cruising to return to land, you might find your healthier, minimalist lifestyle has soured you on having lots of stuff. In our next post, we’ll look at ways to keep expenses down and maximize value.